Equatorial Guinea’s Ministry of Health and Social Welfare, in collaboration with the Foundation for the Development of Nursing (FUDEN), has concluded the training of 153 nurses. Developing a modern, professional nursing corps in the country is a critical part of the government’s efforts to improve the public health care system in the nation. The five-year program was carried out in cooperation with the National University of Equatorial Guinea (UNGE) and the School of Health and Environment (EUSMA), the Spanish Agency for International Cooperation for Development (AECID), the Andalusían Agency for International Development Cooperation (AACID) and the Spanish municipalities of Lugo and Urretxu. The new graduates are qualified to hold management positions in hospitals and health centers. The program has also served to improve the teaching resources and nursing curricula of UNGE and EUSMA. A second phase of the nursing training program is already in place. The government aims to train 50 additional nursing assistants in this new rotation. Equatorial Guinea has placed a priority on improving its health sector, including through in-country training courses and by increasing number of medical students who have study and train in universities around the world. The World Health Organization reported in 2012 that Equatorial Guinea spend more on health per capita than any other African country, with expenditures totaling four percent of GDP in 2011. The government of Equatorial Guinea is seeking additional opportunities to cooperate with its other governments and international organizations to build capacity in the health sector. For the first time, Equatorial Guinea’s voters elected members of a new parliament, House of Representatives as well as municipalities, established in accordance with the constitutional reforms of February 2012. “On July 12, 2013, a new page in the history and evolution of democracy in Equatorial Guinea began with the launch of two major representative bodies that constitute the bicameral Parliament established by our Basic Law, the Chamber of Deputies and the Senate,” said President Obiang Nguema Mbasogo. The Senate has 75 Senators, including Angel Serafin Seriche Dougan, former President of Parliament, who was appointed to the Senate as stated in the Constitution, Senator by right. The Chamber of Deputies has 99 members at the moment. When Seriche Dougan became senator, his position at the Chamber of Deputies became available but will be filled by another member of the PDGE. 1. AGUSTIN NDONG ONA MBUY, 2. AGUSTIN NSE NFUMU, 3. ALEJANDRO ENVORO OVONO, 4. ALFONSO NSUE MOKUY, 5. ANASTASIO ASUMU MUM MUÑOZ, 6. ANATOLlO NDONG MBA, 7. ANGEL ESONO ABAHA MANGUE, 8. ANGEL MESIE MIBUY, 9. ANGEL NDONG ESONO EYANGA, 10. ANGEL SERAFIN SERICHE DOUGAN MALABO, 11. ANICETO EBIAKA MOHETE, 12. ANSELMO ONDO ESONO ASANGONO, 13. ANTONIO JAVIER NGUEMA NCHAMA, 14. ANTONIO PASCUAL OKO EBOBO, 15. ATANASIO ELA NTUGU NSA, 16. BASILlO EDU NGUEMA NZANG, 17. BATHO OBAM NSUE MENGUE, 18. BERNARDINO EDU OBA, 19. BUENAVENTURA MOSWI M'ASUMU, 20. CARMELO MOKONG ONGUENE, 21. DEMETRIO ELO NDONG NSEFUMU, 22. DOMINGO MITUY EDJANG, 23. ELlAS ONDO EDJO, 24. ELlAS OVONO NGUEMA, 25. EUCARIO BAKALE ANGÜE, 26. EULALlA ENVO BELA, 27. FIDEL MARCOS MEÑE NKOGO EYANG, 28. FLORENCIO MAYE ELA, 29. FORTUNATO NZAMBI MACHINDE, 30. FORTUNATO OFA MBO, 31. FRANCISCO MABALE NSENG, 32. FRANCISCO MASA BELOPE, 33. GUILLERMINA MOKUY MBA, 34. HERIBERTO MEKO MBENGONO, 35. HILARIO KOMBA DIVANI, 36. IGNACIO MILAM TANG, 37. JACINTA MBANG NGUEMA, 38. JOSE ANTONIO ELOMBA VIÑAS, 39. JUAN ANTONIO BIBANG NCHUCHUMA, 40. LEOCADIO NDONG MONUMU, 41. LUCAS NGUEMA ESONO MBANG, 42. MANUEL SAÑABA SILOCHI, 43. MARCELlNO NGUEMA ONGUENE, 44. MARCELlNO OYONO NTUTUMU, 45. MARIA NCHAMA BAYEME, 46. MARIA NIEVES EKORO NSANG, 47. MARTIN CRISANTOS EBEE MBA, 48. MARTIN ELA ONDO, 49. MAXIMO MICO ONDO. 50. MELCHOR ESONO EDJO, 51. METODIO SEHE NSI BINDANG, 52. MIGUEL MBA NZANG, 53. PASCUAL ONDO MASA, 54. PEDRO ONDO NGUEMA OKOMO, 55. PILAR DJOMBE DJANGANI, 56. POLlCARPO MONSUY MBA, 57. PURIFICACION BOHARI LASAGUERO, 58. RICARDO MAXIMO TORAO OYO, 59. ROSENDO ELA NSUE MIBUY, 60. SALOMON NGUEMA OWONO, 61. SALVADOR ELA NSENG, 62. SANTIAGO HINESTROSA BEHOLl, 63. SANTIAGO OBAMA NDONG. 64. SANTIAGO ONDO NTUGU ANGUESOMO, 65. SATURNINO OKE ESONO BINDANG, 66. SILVESTRE SIALE BILEKA, 67. TEODOMIRO NZE MANGUE, 68. TEODORO NGUEMA OBIANG MANGUE, 69. TERESA AVORO NGUEMA, 70. TERESA EFUA ASANGONO, 71. TOMAS MECHEBA FERNANDEZ GALlLEA, 72. VICENTE EHATE TOMI, 73. VICENTE RODRIGUEZ SIOSA, 74. VICTORIANA NCHAMA NSUE OKOMO, 75. VIDAL CHONI BECOBA. 1. ADORACION SALAS CHONCO, 2. AGAPITO OBAMA BEE ONDO, 3. ALFREDO MITOGO MITOGO, 4. AMADO NGUEMA OWONO, 5. AMANCIO MITOGO NSE AFANG, 6. AMPARO MELE COLlFA, 7. ANGELA ASUNCION MBASOGO, 8. ANITA MBASOGO OBIANG, 9. ANSELMO SEPA MBAMUALA, 10. ANTONIA MBANG NDONG, 11. BARTOLOME MENE AKOGO, 12. BERNARDO ABAGA NDONG, 13. CARMELO NGUEMA NTUTUMU, 14. CIRIACO TAMARITE BURGOS, 15. CLEMENTINA EDAYONG NDONG, 16. CONRADO OKENVE NDOHO, 17. CONSTANTINO OBIANG ESONO, 18. CONSUELO ONDO NSANG, 19. CRISPIN ENGONO NGUEMA, 20. DAVID MBA EDU, 21. DIOSDADO VICENTE NSUE MILANG, 22. DOLORES NCHAMA SIMA, 23. DOMINGO ANTONIO NVE MBA, 24. ENRIQUETA NZE MIKO, 25. EPIFANIO NDONG SIMA, 26. EUSEBIO IPIKO PENDA, 27. EVANGELlNA FILOMENA OYO EBULE, 28. FEDERICO ABAGA ONDO NFONO, 29. FELlCIANO NVO OLUY, 30. FELlCITAS SAMUEL NDONG MANGUE, 31. FELlSA MADI SUAKIN, 32. FELlZ ANGOSO BAKALE, 33. FERNANDO OBIANG ANGÜE, 34. FILlBERTA PILAR BEKARI JANDU. 35. FILlBERTO NGUEMA AFUGU, 36. FLORENCIO GERARDO ONDO EKANG, 37. FRANCISCA TATCHOUP BELOPE, 38. FRANCISCO ASUMU BIKUY, 39. FRANCISCO MBA OLO BAHAMONDE, 40. GABRIEL BEE NDONG MENGUE, 41. GABRIEL MEMBILA BORILO, 42. GAUDENCIO MUABA MESSU, 43. GREGORIO ESONO MIKO, 44. GUADALUPE NCHAMA ELA, 45. HERIBERTO MATUKU AMAGRO, 46. HERMES ELA MIFUMU, 47. HIPOLlTO MBA SIMA, 48. ISABEL ERAUL IVINA, 49. JESUS EVUY MONSUY, 50. JERONIMO OSA OSA EKORO, 51. JESUS ENGONGA NDONG EYONO, 52. JESUS MBA NGUEMA, 53. JESUSA OBONO ENGONO NCHAMA, 54. JOSE ANTONIO ESONO OBIANG, 55. JOSE EMILlO NDONG MESIE, 56. JOSE PABLO NVO OWONO, 57. JOSEFINA MEDJA NZENG MANGUE, 58. JUAN ASUMU ELA MEDJA, 59. JUAN FERNANDO NVARA ENGONGA, 60. JUAN JOSE ALAIS ESIN, 61. JUAN ONDO NSE MEDJA, 62. JUAN ROKU ENUMBIE, 63. JUAN ZACARIAS ONDO BINDANG, 64. LAMBERTO OWONO MAYE, 65. LEONOR BULA EPAM BIRIBE, 66. LUIS EDJANG NKUMU, 67. MANUEL NGUEMA MUANAYONG, 68. MANUELA AYANG NTONGA 69. MARCOS MITOGO MBA AVOMO, 70. MARGARITA AYETO MBURU, 71. MARIA LUISA SIMA MANGUE, 72. MARIANO NVO NDONG NCHAMA, 73. METODIO MBASOGO MANGUE, 74. MIGUEL EDJANG ANGUE, 75. MIGUEL BOTEY SOBOLE, 76. OLEGARIO OPO BIAHO, 77. PEDRO CRISTINO BUERIBERI BOKESA, 78. PEDRO ONDO MITOGO, 79. PLACIDO MICO ABOGO, 80. PRAXEDES RABAT MAKAMBO, 81. REGINALDO ASU MANGUE, 82. ROBUSTIANO MOMOCOBO TALE, 83. RUFINO CAMARERO PELAYO, 84. SALOMON NFA NDONG NSENG, 85. SALVADOR BENGONO BENGONO, 86. SALVADOR BONSUNDI MABALE, 87. SALVADOR ELA NDONG MBUY, 88. SALVADOR NGUEMA MANGUE, 89. SAMUEL ATEBA OWONO, 90. SANTIAGO CASTO NVOMO BIBANG, 91. SANTIAGO GABRIEL OSCAR NSUE MOKUY, 92. SANTIAGO NGUEMA ABAGA, 93. SANTIAGO NSOBEYA EFUMAN, 94. SANTIAGO ONDO ESONO, 95. SEVERINO ONDO NGUEMA, 96. SILVESTRE ABAGA EYANG, 97. TIBURCIO NDONG NGUEMA AYINGONO, 98. VENANCIO KAMI MOKATA, 99. VICTOR ONDO NSO MBASOGO. Equatorial Guinea’s Minister of Information, Press and Radio, Agustin Nze Nfumu, and U.S. Ambassador to Equatorial Guinea Mark L. Asquino, recently discussed the possibility of establishing English teaching programs through radio and television. Ambassador Asquino suggested the English-teaching program during a July 16 meeting with the minister. The government of Equatorial Guinea has made steady efforts to improve training and increase employment for its citizens. “Cooperation in the audiovisual media should include the training of the Equatorial Guinean staff,” said Minister Nze Nfumu. During the meeting, Minister Nze Nfumu and Ambassador Asquino also discussed about the possibility of signing cooperation agreements between Equatorial Guinean television and the U.S. channel Voice of America. Equatorial Guinea and the U.S. have enjoyed good bilateral relations and the continuous collaboration between them shows how the West African nation’s government is dedicated to improve education and the standard of living in the country. Investments in education pay off. UNESCO estimates an even higher rate. The African Economist recently ranked Equatorial Guinea the country with the second-highest literacy rate among 52 African country. The magazine cited an adult literacy rate of 87% for Equatorial Guinea; however, the magazine may have understated the West African country’s literacy rate. In 2010, UNESCO reported that Equatorial Guinea had the highest adult literacy rate in Sub-Saharan Africa, at 93%. Equatorial Guinea has made steady efforts to improve education and promote culture and literacy over the last 20 years. The African Economist survey used available census figures in compiling its rankings, and breaks out literacy by total population and gender. The country’s literacy rate is the product of cooperation and partnership with world-renowned universities in the United States, Latin America, Europe and Asia, and from public-private partnerships. National and international economic experts will come together in November 2013, in Malabo, the capital of Equatorial Guinea, for the Symposium on Equatorial Guinea's Economic Diversification. The Economic Diversification Conference is organized by the Ministry of Finance and will be held at the Sipopo Conference Center, as part of the country’s efforts to achieve economic diversification and reduce its dependence on oil production. The conference highlights Equatorial Guinea’s launch of the emergent phase of its Horizon 2020 development plan, which was set in motion by President Obiang Nguema Mbasogo. The symposium is an open invitation to the international community to participate in Equatorial Guinea’s next development phase. It will be focused around investors interested in learning about the opportunities arising from emerging economic sectors, serve as a forum to discuss their views with key players and decision makers, and allow participants to see first-hand what the country has to offer. Major international organizations, such as the World Bank, are working closely with Equatorial Guinea’s Ministry of Finance to develop the conference, which is aimed primarily at international investors. Equatorial Guinea’s Prime Minister, Vincente Ehate Tomi, discussed the nation’s recent development programs at the 34th Summit of the Caribbean Community (Caricom) this weekend in Trinidad and Tobago. As Chairman-in-Office of the Summit of Heads of State and of Government of the ACP Group, the Prime Minister shared the Government’s Action Plan for Economic and Social Development, which was started in 2007 and has contributed to significant reform within the country. 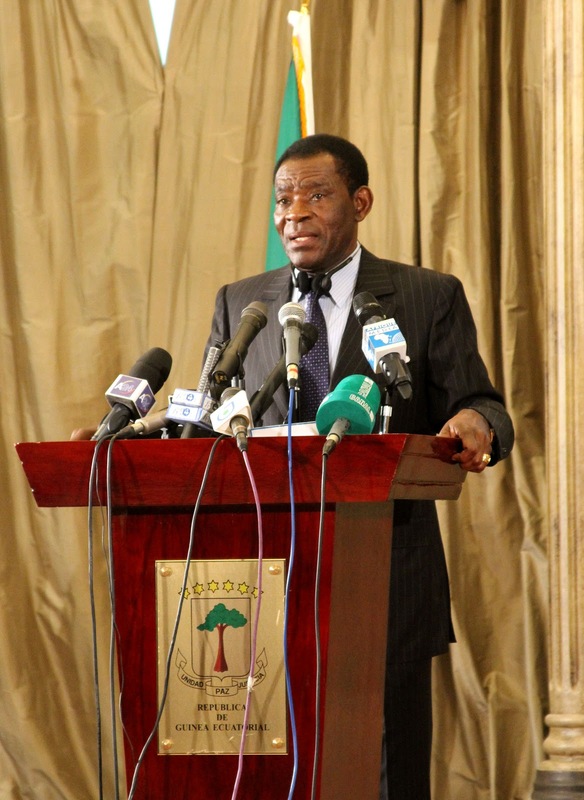 According to the Prime Minister, Equatorial Guinea’s Action Plan reflects the country’s plan to become a modern and emerging country by 2020 and has similar goals to those of the ACP Group and Caricom. As stated by Caricom’s Secretary General Ambassador Irwin LaRocque in the opening speech, Caricom strives to promote collaborative reform to expand sustainable development in various sectors. Equatorial Guinea’s participation in Caricom reflects the country’s commitment toward development and playing a bigger role in the international community. In addition to Caricom, Prime Minister Ehate Tomi also represented President Obiang at the Summit of International and African Leaders for the Elimination of Hunger in Africa, which was held in Addis Ababa, Ethiopia. President Obiang of Equatorial Guinea encouraged gas-exporting countries to join Equatorial Guinea in working to reduce carbon dioxide emissions (CO2) from the burning of gas in oil production. He made the remarks as he discussed recent growth and development in the oil and gas industry in Equatorial Guinea on the opening day of the Second Summit of the Organization of Gas Exporting Countries (GECF). The forum started Monday, July 1, at the Grand Kremlin Palace in Moscow, Russia. It brought together international leaders such as President Obiang, Nicolas Maduro of Venezuela and Evo Morales of Bolivia, to discuss developments within the global gas industry and promote solidarity within gas exporting countries. Equatorial Guinea has been ending the practice of flaring natural gas in its offshore oil fields and has been building facilities for storage and export. During his speech on the opening day, President Obiang also reiterated the summit’s goal to promote unity among the participating gas exporting countries as the gas industry continues to evolve. Participants spent the two days analyzing opportunities to defend the interests of exporting countries and promote growth for the future.